It’s the first Friday of March, and it’s a good day for me to share some happy things from my week. 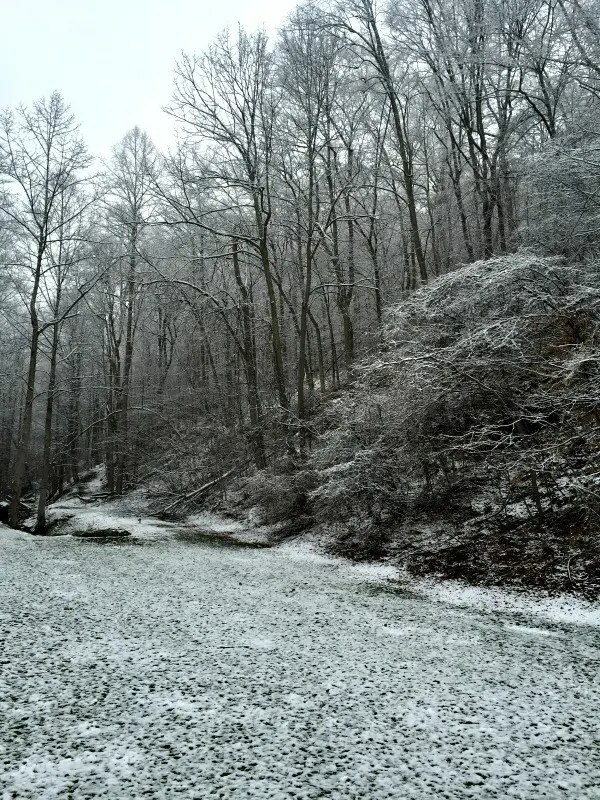 I’m not complaining; I think the snow is beautiful! 2. 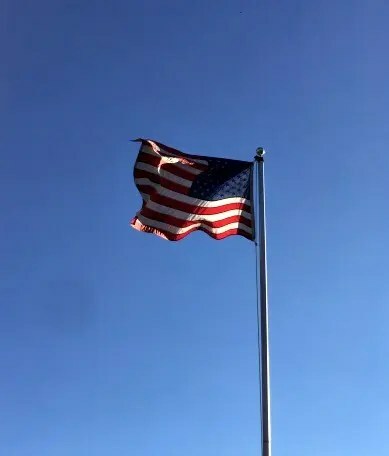 While out for a walk one day, I spotted this American flag waving in the breeze. In spite of everything going on in our country right now, I’m STILL very thankful for this flag and the freedoms it represents. 3. Some of you know that I collect vintage Pyrex. 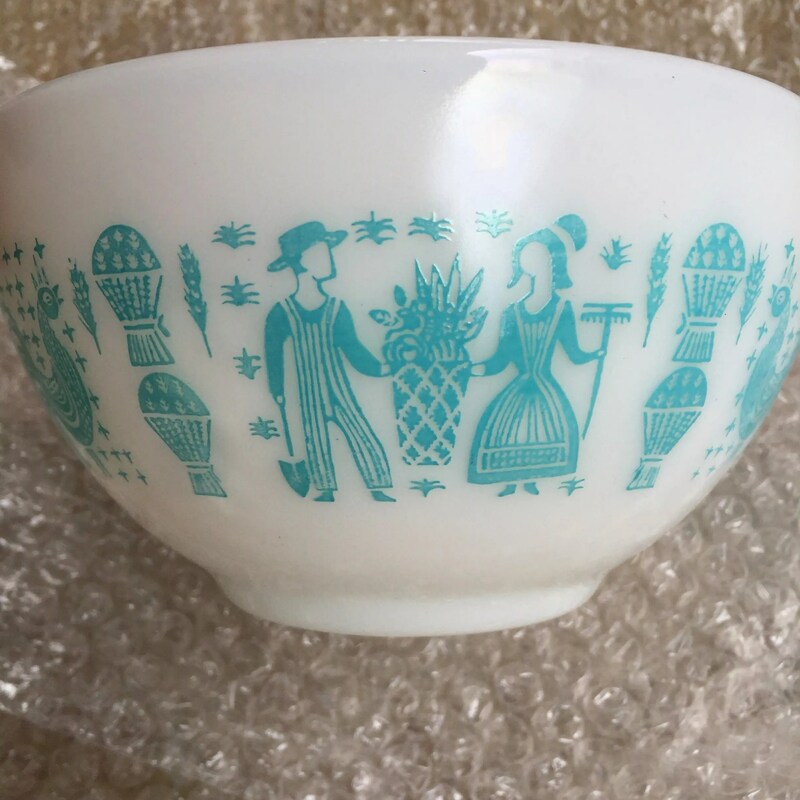 I was in an antique store one day and spotted a bowl that I needed to complete one of my Butterprint sets, but it was being sold with two other bowls that I didn’t need. I asked the manager to call the vendor to see if she would be willing to sell me just the one bowl, and the vendor agreed! I was excited to be able to complete my set and get the bowl for a really great price. 4. 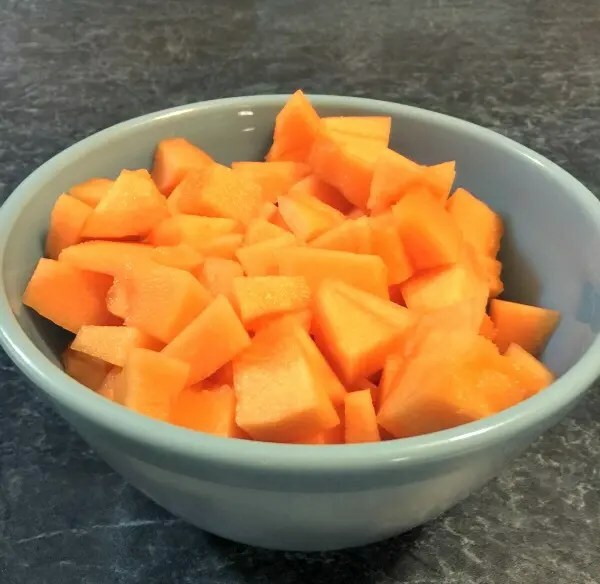 Cantaloupe is one of my favorite breakfast fruits. I bought one this week hoping it would be good, and it tasted so sweet and fresh. 5. This past October, a teen in our community was paralyzed after a suffering a spinal cord injury. He’s been in various hospitals ever since the accident, most recently at one in Atlanta. He’s on his way home today, which is such a miracle! He still has a long road ahead of him and will be going back into the hospital in a few months, but we are excited that he has made enough progress to be able to go home. I would appreciate it if all of my praying friends would lift up Trevor and his parents today. He’s such an amazing young man! Happy Monday, Friends! I hope you had a good weekend. We had wonderful services at church yesterday. Both the Sunday school lesson and evening preaching focused on prayer, which was fitting since our week-long tent revival starts tonight. I was convicted about my need to communicate more with my Saviour. I’ve really been praying about this week, asking the Lord to send folks our way who need to hear the gospel, to turn hearts (including mine) toward Him, and to have His will accomplished as a result of the special services. 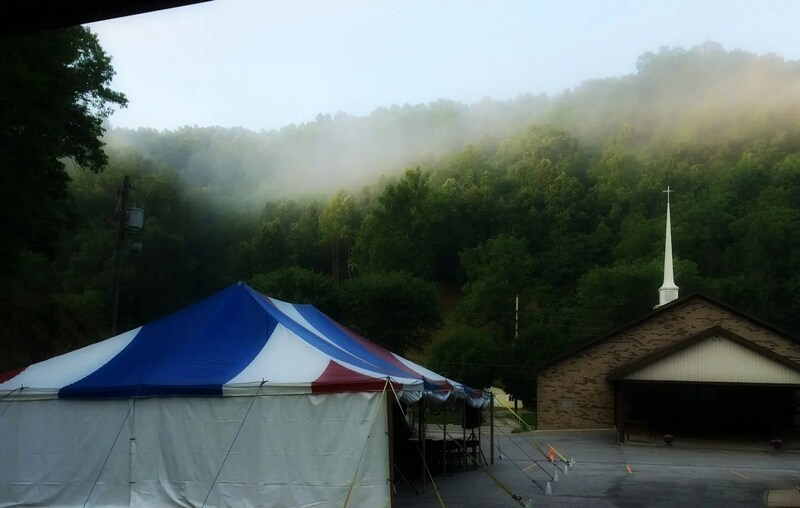 If you are one of my praying friends, please add our tent revival meeting to your prayer list. I’ll let you know how it goes. Thanks so much to all of you who have been praying for me. I am so thankful for the power of prayer! I have received emails and cards from people all over the world letting me know they are praying. Last Friday I began having severe pain and made another trip to the hospital. Tests revealed an abscess in my abdomen. The surgeon had warned us that this was a possibility following surgery because of the severity of the peritonitis. The doctor wanted the radiologist to drain the abscess, but because of the holiday weekend, the radiologist wanted to put it off. So, I spent the next couple of days waiting. I couldn’t have anything to eat or drink, so I was pretty miserable with just the I/V fluids. The hospital is no place to be on a holiday weekend! Sunday morning I had another CT scan done. It revealed that the abscess was a couple of centimeters smaller. They wanted to wait and do another scan the following day, but we asked my doctor if I could go home on antibiotics to wait it out because I was just miserable in the hospital. He agreed, and I came back home late Sunday. Yesterday I went to see the surgeon. He believes that the abscess will resolve on its own. I have a rather large incision on my stomach from the most recent surgery. The staples were removed last week, but the surgeon had to open part of it to release fluid that had built up. The opening in a bit larger now and looks awful, but the surgeon said it is healing. My amazing husband, who has taken such great care of me, continues to act as my “nurse”. He’s taken a break from his responsibilities at church for the last few weeks and hasn’t left my side except to catch up on sleep. He is constantly looking for ways to make me more comfortable or fixing me a meal. We’ve had families from church bring food. Our moms have taken care of the kids for most of the past month. I feel blessed to have so much help! I have felt so out-of-touch lately, but I guess that’s to be expected. I missed all of the year-end activities at school and Lil’ Nut’s kindergarten graduation, but I’m thankful to those who stepped in and took on many of my responsibilities to keep things running smoothly at school. I haven’t worried about any of it, because I know that it’s all out of my control. It has been encouraging to be able to watch our church services live via the internet. It’s not the same as being there, but it’s close. Right now I’m just taking things day by day. I go back to see the doctor tomorrow, and hopefully I’ll get a good report. I am not taking any pain medication now; it really slows down the healing process. Thanks again for lifting me up in your prayers, and thank you in advance for continuing to do so. In my last post I wrote about looking back and treasuring each day God gives me. That was close to being my very last blog post ever. Just two days later, after the Sunday morning church service, I began experiencing the worst abdominal pain of my life. Steven rushed me to the hospital where I underwent countless tests and eventually a full abdominal exploratory surgery which showed that my intestines had been perforated in two places during the laproscopic procedure that had been done earlier this month. The repairs were made, and after seven excruciating days in the hospital, I came home. I don’t have the strength or words to express what this has been like. I know that everything is a part of God’s plan. I know that He has given me the most amazing man in the world who has been by my side through every dark moment. I know that each day is full of new challenges, pain, and frustration. Most importantly, I know that my Saviour has never left me alone. He is holding me in the palm of His hand, and that’s the very best place for me to be. Yesterday’s nasty weather hit close to home last night–literally. A tornado touched down in the subdivision right down the road from us while we were sitting down to supper. Fifty people are now homeless, but miraculously no one was injured. I didn’t even know that anything had happened until I left the house this morning and saw all the emergency vehicles. We later learned that the same tornado hit a house just four doors down from my in-law’s house. They never heard a thing, either. I am so thankful for the Lord’s protection! I spent a couple of hours at the hospital today with my good friend Alesha. Her sweet little boy underwent emergency surgery this morning and is recovering tonight. I am praying that there won’t be any complications and that he will be able to go home sometime this weekend. I’m sure that Alesha would appreciate your prayers for Isaac. These two unexpected events remind me that difficulties often arise when we least expect them. There are things that we have no control over. What a comfort it is to know that our Saviour has promised to never leave us or forsake us! We can trust His faithfulness. For it’s skies may turn to gray. Our church’s radio ministry began its annual fundraiser, Restorathon, early this morning. As a listener-supported radio station, this three day event plays a vital role in the continued operation of Gospel 90.3 FM and www.gospel903.com. We are praying that this will be our greatest Restorathon ever! If you get a chance, tune in online between now and midnight Saturday. Your heart will be blessed! UPDATE: Praise the Lord for over $220,000 pledged during Restoreathon!! I can’t believe last week flew by as quickly as it did! We spent most of the week at home and enjoyed Christmas together as a family. The kids received a Wii for Christmas and have spent a lot of time playing games the last few days. Thankfully most of the games are sports related, so they are able to get some exercise while they’re having all that fun. I hope all of you had a blessed time with your family as well. We did receive some bad news on Friday. Our wonderful friend Bro. Cameron passed away around 6:00 p.m. Christmas day. You might remember that I requested prayer for him a while back after he was severely burned in an electrical fire. He never came out of the coma and peacefully went to be with his Saviour on Friday. My heart is so grieved for his dear wife and family, but what a relief to know that he is no longer in any pain! He is with the One he spent his whole life serving. We’ll be leaving early in the morning to head to Georgia for the funeral. Pastor Steven will have a part in the service. I would appreciate your prayers as we travel and for the Cameron family as well. I’ve been scurrying around today in preparation for our trip. I called to make a reservation at the vet’s office to board Toby. They said that he’s due for shots right now, so we have to pay $139 for the shots PLUS the cost of boarding. On top of that wonderful news, we had to take my truck in to have it serviced today. Oh, what joy! None of these expenses are a surprise to the Lord. He knew in advance that we would be traveling and provided for our needs. We received some money for Christmas that will help with pay for our gas and hotel, and my hubby received a love offering just yesterday from a church that will cover the vet bill. I don’t know why I worry about these things; God always makes a way! That’s where I’ve been the last couple of days. Wednesday afternoon I started having some stomach pains that intensified as the evening went on. By the time I got home from church I was in tears. I knew from past experience that the pain was an indicator of a serious problem. First thing Thursday morning I was able to get in to see a doctor. He sent me straight to the ER. To make a long story short, scar tissue from an emergency surgery five years had caused some major complications, and I had to have surgery Thursday afternoon. I am home already, praise the Lord! That in itself is such a blessing! I am extremely worn out and in quite a bit of pain, so I don’t expect to be on the computer much for at least a couple of days. I just wanted to give a quick update since several of you have heard I was in the hospital. Please keep me in your prayers as I recover. Thank you all so much your prayers for my father-in-law. Praise the Lord, he was released from the hospital today and is now resting at home! We’re still not sure what caused this sudden illness or when and if it will return. There may be more tests in the coming days. I’ll be heading home soon. Thankfully home is just 7 hours away. I have much to do when I get home, so I’ll check in again in a few days. P.S. It is 89 degrees here today. Now I remember why we moved away from Florida! Several days ago my father-in-law became ill with a blockage in the upper digestive tract. He has been in the hospital while the doctors have been trying to remedy the problem without resorting to surgery. The church he pastors began a 24 hour prayer chain on Sunday. He had a better night last night and is feeling a bit better today. I am in Florida right now to be a help and encouragement to my mother-in-law. I will be here as long as she needs me. I am terribly behind on comment moderation and answering emails, but those things are on the back burner right now. Your prayers for my father-in-law would be greatly appreciated.